SM-80 is an add-on wireless PIR motion sensor for SecurityMan Air-Alarm system. Its wireless transmitting distance is up to 450ft (in open area). It includes a 9V alkaline battery which could last up to 2 years. Motion detection range is 100° 10x10m. 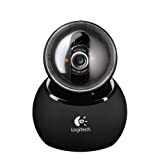 Logitech alert 700i indoor add-on camera expands the coverage of your existing logitech alert system. SecurityMan Air-Alarm1 is a state-of-the-art wireless alarm system kit for homes and businesses. It is user-friendly easy to use protecting homes/businesses at a minimum cost of investment. Do-It-Your-Self installation and monitoring alarm system without monthly fees is a key benefit for users. The system will alert by phone calls to owner through a series of enlisted phone numbers. The owner can then dial into the host to armed or disarmed using the phone¿s numeric keypad. Air-Alarm1 system can be upgraded by adding up to 60 wireless sensors, sirens, and up to 8 remote controllers.